This is the folding circle, the team who attacked and overwhelmed Thrash in last issue. Their leader, Left Hand, has gathered them because their fate is connected and crab, and Thrash is the final piece in the puzzle. Why do they all believe Left Hand on his word? I have no idea. 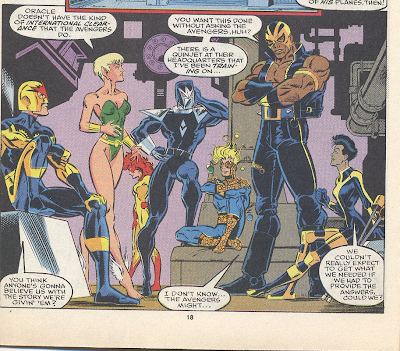 By the way, those shades that the big half-naked guy named Bloodstrike is wearing; do they exist? Cause I totally want a pair myself. Don't cry boys, you are still daddy's favorites. Anyway, Thrash joins the Circle to find the truth, whatever that is. Meanwhile, the Warriors finds a badly hurt Silhuette. She was attacked by Tai, who apparently is the one behind the corruption of the Taylor Foundation. After taking Sil to the hospital, the Warriors visit Chord who has woken up from his coma. He explains that Tai, who has mystical powers, has healed him, even though she couldn't restore the brain-tissue he had lost. Chord tells them that Tai is in Cambodia, ready for Thrash arrival, and that it's all about a pact five soldiers, including Chord, made with Tai. Chord can't explain much to the Warriors because of his brain-damage, but they get that Thrash is going to be in trouble, and that they have to save him from Tai, who apparently isn't just a fortune-cookie lady. But the problem is that A) They are undermanned, since Thrash is the one they are suppose to save, Vance is under arrest, and one of them has to stay to represent the New Warriors (in this case Firestar) if necessary in Vance's trial, and B) None of them can fly the helicopter. But the Warriors get's help from two of their allies; Darkhawk, a fellow teen superhero with a magical amulet, and Rage, a 12 year old boy trapped in an adult super-strong body, who's also a member of the Avengers. Alright then, now they have a big enough team. But what about transportation? Well, Rage can't fly a helicopter, but he CAN fly a jet (barely). He is an Avenger in training (The Avengers doesn't know that Rage is only 12) and has learned briefly how to fly one of their quinjets. And since its unlikely that the Avengers would believe that an 80 years old lady is going to take over the world, the Warriors only has one option left: They must steal the Avengers jet. Our heroes, ladies and gentlemen! They high-jack expensive planes from the local authorities! Meanwhile, Vance's trial has started. His defense-attorney is no one else but Foggy Nelson, but the other lawyer is not wet behind her ears either, so it's not going to be pretty. Foggy does all he can to make his point that Vance acted in self-defense, and that he is a genuinely good person, a hero too, who would never harm a person by choice. 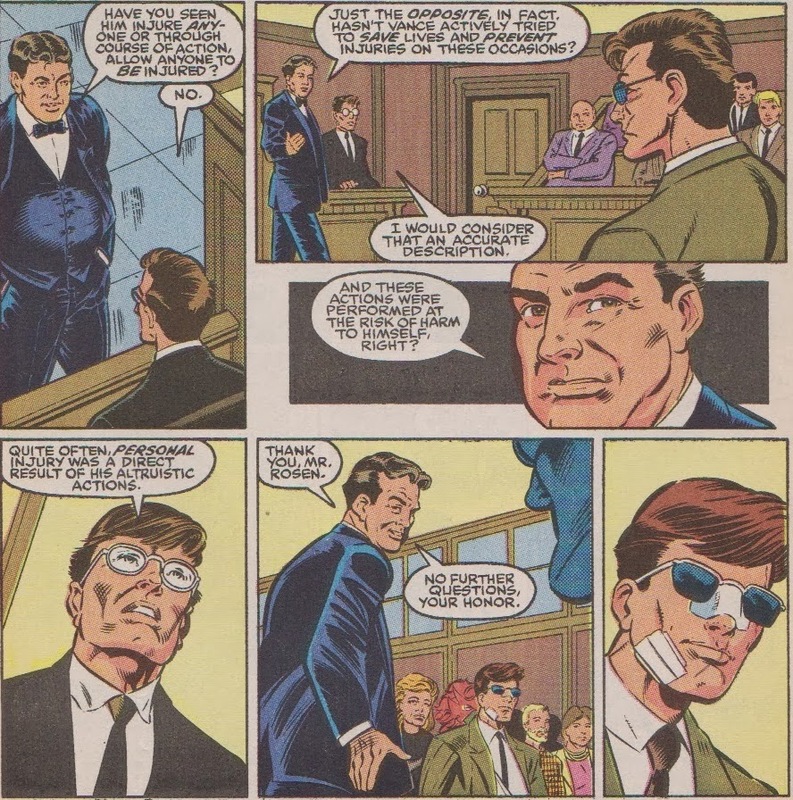 Unfortunately the other lawyer, Racheal Dreyfuss, does just as good a job to point out that Vance has shown, in his identity as Marvel Boy, to have great control over his powers, and that he could therefor, in theory, defend himself without the need of lethal force. Meanwhile in Cambodia, the Folding Circle has found Tai inside an ancient temple, where they get caught by her and we get an explanation for what the hell is going on. Tai is an evil sorcerer, and like all other evil sorcerers, she wants to conquer the world. To do so, she needs to sacrifice members of her clan who has blood from bout East and West, so she abducted a bunch of American Solders (among them were Thrash's father and Chord) so they could marry and breed with her daughters, so she could sacrifice them to get the power. Look, let's cut the crap: Tai is a magic evildoer, she want's to rule the world, and she killed Thrash's parents. Lets get to the big fight already! The Folding Circle and the Warriors unite their forces to fight for their life. Tai is pretty much Vietnam's Sorcerer Supreme, but she needs to concentrate. Unfortunately, she is no pushover in close combat either, so hurting her is easier said than done. Thing looks pretty bad when the Circle runs away with their tail behind their legs, but by a stroke of luck, Thrash manege to gun down Tai (BTW, I forgot to mention that Thrash carries a machine-gun) and as Tai screams in pain, the temple (of coarse) collapses on itself. Its over. The Warriors has saved the world from the most confusing plan ever made by a comic-book villain (and that says allot) and Thrash has finally avenged his parents. Unfortunately, his victory is hollow, now hat he know that he has been lied to and manipulated into every decision that has led him to where he is now, and that his life has been based on a bunch of lies. And just to make it perfect; Vance has been found guilty in negligent homicide and sentenced to 14 mounts in the superhuman prison The Vault with minimum security. It could have been MUCH worse, not that it is much comfort for Vance, or Firestar, who has recently discovered that she loves him.